Rhampholeon spinosus, a lumpy-nosed chameleon that can fit on the tip of your thumb, doesn’t exactly inspire awe at first sight. But don’t let its size fool you: in one respect, this little lizard is among the most powerful machines on Earth. It’s got a tongue that moves like a supercar. Indeed, when R. spinosus whips out its tongue to snag a cricket, it produces an acceleration 264 times greater than the force of gravity, according to research conducted by biophysicist Christopher Anderson and published today in Scientific Reports. Your Tesla Model S may go from zero to 60 mph in under three seconds, but this scaly pipsqueak can achieve the same delta-v in one three hundredth of that time. The startling discovery came about when Anderson—who has been studying the biomechanics of chameleon tongues for years—decided to see how power output differs among different species. So, he gathered individuals of 20 species that vary widely in size, from several inches to several feet in length. One by one, he perched his subjects in front of a camera that shoots at 3,000 fps, and proceeded to dangle an extremely unfortunate cricket in front. When the chameleon’s tongue lashed out to nab the irresistible snack, Anderson was able to measure distance, elapsed time, speed and acceleration. The first thing Anderson noticed was that smaller chameleons wield tongues with higher peak accelerations. And the smallest of all—R. spinosus—outperformed its larger counterparts by nearly a factor of ten. According to Anderson’s calculations, R. spinosus’ tongue has the highest power output per mass (14,040 Watts per kilogram) of any known reptile, bird or mammal. What’s the tiny chameleon’s secret? Elastic tissues that “preload” most of the tongue’s total energy. Just as pulling back a slingshot before firing it allows you to shoot a projectile further and faster, the recoil from elastic tissues greatly enhances the tongue’s overall firing power. 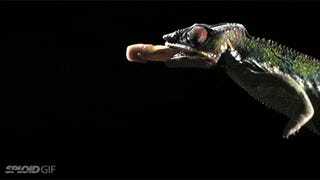 Anderson suspects that a turbo-charged tongue gives smaller chameleons a better chance of catching prey and meeting their relatively high caloric needs. Don’t you just love science sometimes?